When describing the iPhone 4S, it would be far easier to list what not to like about this mobile phone than it would be list what there is to like. 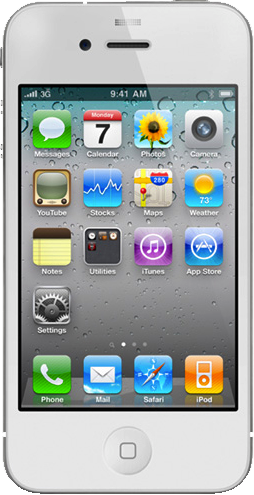 With the iPhone 4S, you get 1.5-gigahertz speed from the dual-core processor, a rear-facing, 8 MP camera with tremendous optics and with 1080p video capability – in HD! And that’s without noting the radio or audio or video files or all the apps or … or … or …. The mobile phone’s Retina display brings you sharp, clear, almost magically enhanced images, graphics and text, supported by a pixel-per-square-inch count so high that the human eye cannot distinguish them! You almost have to look twice to see if the clarity was a mirage – then you delve into the world in front of you. The dual-core A5 chipset loads graphics up to seven times faster while delivering you twice the power. Surf, text, tweet or post to Facebook for hours. Watch a film. Play a game. Shuffle between several apps and check e-mail, and you can continue your activities for a long time, as the Apple iPhone 4S smartphone has great battery life. The rear-facing 8 MP camera brings brilliant resolution, full optics features that keep zoomed close-ups sharp and intense. Reduced motion blur, a larger f/2.4 aperture, optimised backside illumination sensor, terrific auto-white balance and amazing colour accuracy. What does all that mean for you? It means you get, well, picture-perfect shots every time, even with large groups of people, for the iPhone 4S gives you automatic face detection as well. How would you like to shoot a documentary with your smartphone? The amazing 1080p HD video recording capability in the iPhone 4S can do just that. Catch the action in a pick-up game of football or your favourite sport. You’ll catch more detail and never have to worry about the light level. Your video just might seem crisper than your memory! was waiting for the 5 to come out to get the 4S at a good price, definitely found the best deal here. Cheers! Finally decided to get myself the iPhone 4S now that the 5 is out and I can find a good deal. Delivery was very quick, as well. From the price, to the handset, to the service, I'm very pleased! Got a great deal on the phone, plus it arrived quickly. Many thanks! Compared this model and the iPhone 5 and didn't see enough of a difference to pay more for the newer handset. I'm quite pleased with my 4S, got it at a good price. got an amazing deal on the 4S now that the 5 is out. Really happy, been waiting for the release so I could get the 4S at a good price. Thanks. Don't need to pay more for the 5, the 4S is perfect and at a good price, now. Cheers. decided to pass on the 5 and went with the 4S, everyone I know loves their 4S and isn't looking to upgrade. Glad I did, very pleased. Was a fast and easy process to get my phone. I wasn't sure I could get the iPhone, but I finally got mine. Going to recommend this site to friends. Been looking to get this mobile for awhile, hadn't looked online until now and really didn't think it would be this quick. Really quite chuffed, cheers. never bought a mobile online before, but got mine today and am really pleased. Will recommend to my mates, cheers.